Here’s something that we really have to share with you. 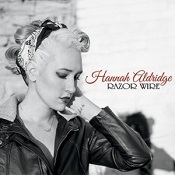 It’s an album from 2014 by Hannah Aldridge called “Razor Wire” and the title gives more than a hint at the lyrical content; it’s painfully honest and uncompromising, which isn’t so surprising when you discover that her musical hero is Jackson Browne. She describes her music as ‘dark Americana’, which is probably right on the money with musical stylings straddling the country and country/rock genres providing a platform for Hannah’s strong yet vulnerable vocals and confessional lyrics. The eleven songs on the album, plus a bonus acoustic version of the title song are shot through with melancholy and a willingness to shine a torch into the murky basement of a life that hasn’t always followed a straightforward path. There are references to addiction (“Lie like You Love Me”), taking control of your destiny (“Howlin’ Bones”) and wrecked relationships (“Razor Wire”) although there’s also the more introspective, nostalgic feel of “Black and White”. Despite using so much biographical detail, the person delivering the songs isn’t quite the real Hannah Aldridge, she’s a character who shares the same past but has a different, harder attitude to its reality and to risky behaviour. This is an album that transcends genres; it’s rooted in Americana, and the Muscle Shoals tradition, but the quality and the delivery of the deeply personal songs create a piece that’s essential listening for anyone remotely interested in high quality songwriting.